Most Vallarta visitors know and enjoy the Cuale River and its lush and shady island, the fresh breeze, the colorful vendors and the loving sound of its free flowing waters. I spend most Saturdays there enjoying the friendly ambiance of the used books bazaar on the old bridge. But a few days ago I was invited to join those brave hearts who enjoy flying at high speed over rivers and between mountains, hanging from a pulley at great heights. Masochism? I loved it! 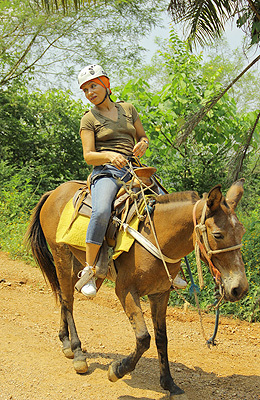 To begin with, you ride an open truck away from the streets of Vallarta, following the bed of the Cuale River on paved roads, cobblestone and exciting narrow dirt tracks that climb the jungle-covered mountains of the Sierra Madre. The summer rains have made the mountains blossom with the brightest greens one can imagine, it is a true explosion of colors your eyes have a hard time adjusting to. Once atop the Sierra, we are fit with harnesses and helmets and briefed on the procedures and basics on which this adventure operates in order to enjoy it to its extreme best, safely. Then we start moving on into the trail leading to the first line. This one is over one hundred feet high and twice as long tunneling through trees’ canopies and over the turbulent Cuale underneath. But that is not much compared to what comes next; there are higher, longer, faster zip-lines awaiting you, and some hiking as well. The adrenaline and the views are spectacular! 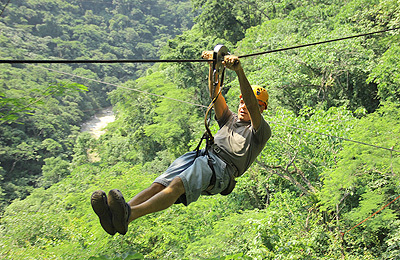 There are about twelve zip lines, each has a sign with its name, height, lenght and approximate speed. What I will not tell you about, is the unexpected extra fun evolving as you experience every stage of the adventure. When you have completed the flying part of the journey you get your own personal mule for a roughly twenty-minute ride back to the starting point. We had time to relax, have a drink and a bite to eat (extra charge) and attend a tequila tasting session (free). We even had time to lay in their hammocks for a very civilized Mexican Siesta. Man, what a way to top it off!